If you haven’t heard, or forgotten recently, there was an earthquake last week. I know, earthquakes happen all of the time. But this one was a little different. Folks of America’s mid-Atlantic states felt the effects of a 5.8 magnitude earthquake in the middle of the day on August 23rd. The quake had an epicenter more or less in central Virginia, near the town of Mineral (how ironic). USGS has mentioned that this town is known to be somewhat tectonically active, however, not to the degree of the August 23rd rumblings. A few days after the quake, maybe the day after, I am not sure – the Department of the Interior held a video chat with a geologist who’s name escapes me, in which anyone involved in the chat could email or type into the chat log (if you had the proper live stream account) any, and I mean ANY questions one might have about this particular earthquake. I selected some questions from the chat to answer on this here geology blog, more so for something to do (slow first week), but also in case someone aimlessly surfing the interwebs for earthquake information might stumble across and find some myths of earthquakes either busted or confirmed, to the best of my own ability. For my readers who obviously know more about earthquakes than myself. Please feel free to correct any of my own interpretations, but keep it civil – I am a sensitive geomorphologist. 11:08 AM Joakim: I noticed that there were earthquakes all across the continental u.s. last year – do you have a hypothesis why this is the case? I am guessing Joakim felt to quake, searched Google for earthquake information – which will ultimately lead you to the USGS websites. Here you can find pretty much anything you’d ever dream to learn about earthquakes. However, most will go straight to the visual aids here, without reading a little about earthquakes. It is very true that there are earthquakes EVERYWHERE. Thousands of earthquakes happen every day, and it is likely that a quick glance at a USGS earthquake map of the United States would lead one to believe that the country is constantly being shaken by earthquakes. 11:08 AM columbus: should we be worried about the new madrid fault or yellostone? This one is for the commenters to discuss! Digging for this question was surprisingly short and sweet – this was one click away from a geology.com article. I typed “geology of new york city” into Bing search and was quickly rewarded. As a geoscience student, I know how to search for geologic questions – techniques most may not be familiar with. As you can see from the image, adapted from Sykes, et al. ; there are plenty of faults in the Tri-state region and surrounding area. Along these faults one may notice many earthquakes, as well – but also notice that their magnitude is very, very small. Most of these earthquakes were likely not even felt, with the exceptions of those of greater than 3.5 magnitude. The question asked about the island of Manhatten in particular, and this is where it gets a little tricky. No, there is not really a highly developed fault line here, but in the case of earthquakes the “map-view” location of the earthquake is not necessarily where the quake will occur. Faults are rather imperfect. What seems like a purely straight line along the surface may be a sinuous, curvilinear or even diagonal plane underneath the surface. It is important when interpreting structural maps such as this to be aware of the odd natures faults may take. 11:08 AM Caitlin: Why wasn’t the earthquake predicted? Is there monitoring for earthquakes on the East Coast? Hello Caitlin, I would like to thank you for using proper grammar. I will answer the second question first: Yes. There is plenty of earthquake monitoring is not only common in seismically active regions, but also on the east coast and worldwide. The United States Geological Survey has a great wealth of resources invested in this department, and by visiting their site you can see just how much monitoring is going on. Your second question is one fielded by geologists on a daily basis. While it may seem that earthquakes are common and systematic – especially in highly seismic areas, they are not predictable. We are able to determine where they are most common and can take measures to make sure these areas are less susceptible to damage. 11:21 AM Lisa: There are no real “patterns.” The movements are more like openning a stuck pickle jar. You can twist hard, but can’t predict which split-second that stress is going to overcome the friction. …and this is actually a really great response, and to further explain on it seems unnecessary. +1 for Lisa! 11:10 AM Heathyr: IS cONTINETAL DRIFTING CAUSEING THE OLD AFRICAN FAULT TO RECATIVATING? “Heathyr” had been spamming this question, roughly every 20-30 seconds throughout the live chat. The chat commentators gave in and answered this question, which was, essentially “no”. It is somewhat difficult to ascertain what exactly Heathyr was asking, but I believe this goes back to models of continental drift in which North America and Africa were in a collisional environment before transitioning to a divergent one. 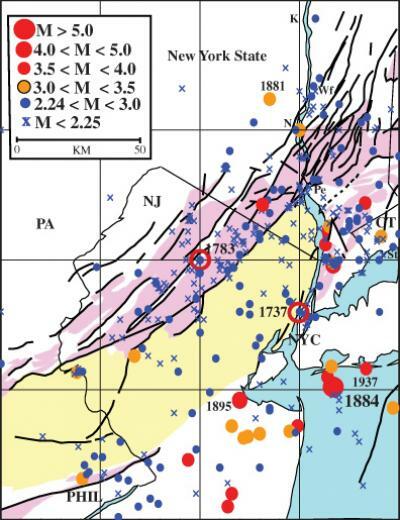 I believe it is important to answer this question the way the geologist on the program did – this was an intraplate earthquake, not one present on a tectonic boundary. The “Old African Fault” she is likely referring to can be translated to the present day Atlantic Mid-Ocean Ridge. To clarify, this is not a fault, but a crustal spreading zone. Here, the North America is diverging from the Eurasian and African plates by means of sub-sea-surface volcanism. This boundary is indeed active – but not necessarily “reactivated” by continental drifting, as it never really became inactive. Seismic activity is here is more a result of magma moving just beneath volcanoes rather than fault slippage. This user was from the tri-state area, Connecticut, I believe. Most of the chatters were, and most were concerned about the likelihood of seismic activity in that area, and less about earthquakes in general. There will be aftershocks, yes, but not necessarily another, separate earthquake. I worry that this colleague may have been fanning the flames of fear to their fellow employees and taking the Virginia earthquake and making Japan 2011 earthquake assumptions from it. Aftershocks from this year’s Japan earthquake would be considered large here – aftershocks of the Virginia quake will (and have been) much less common and less powerful. As far as I know, we do not have any data that suggests that one earthquake will cause another, so in this case, this colleague’s comment was unwarranted. Eh, no. I am not going to say that. 11:22 AM KgSpn: Are Polar, Glacial, and Greenland ice mass melting changing weight distributions of earth’s crustal plates? If so which crustal plates are most vulnerable to compenstate? The short answer here is no, but this is a really great question from KgSpn. The weight distribution of the continents itself is not likely to change because of melting ice sheets. There will, however, be a rebound affect from the removal of mass above the continents. After ice sheets leave a region, the land mass they were resting upon can rebound slowly (or quickly, depending on rate of retreat, how much mass is removed and lithology beneath the sheets) but the subsequent readjustment of the earth’s crust is not likely to create massive earthquakes. the question is slightly off-topic, but had a good scientific thought process to it. I liked it – and correct grammar, as well! 11:24 AM SalMarie: Is there any publish research that you recommend for people to read to better understand seismic activity? Published research is not the way to go here. For someone looking for explanations of seismic activity, the internets – including the knowledge beacons that are Wikipedia, geology.com, United States Geological Survey and even National Geographic or the Discovery Channel are usually excellent resources for those with novice geologic background.